Whoa. The Naval Diplomat attempts to go on travel, and gets whiplash from the maritime news cycle. Attempted travel? You know the routine. Nighttime flight, broken airplane, every 15 minutes a sorrowful agent comes on the speaker to announce departure is 15 minutes off. Etc. Eventually I clambered into the Diplomatmobile, fired up the rocket assist, and hurtled back down I-95 to my undersea lair somewhere on Narragansett Bay. Fuggedaboutit. So I was offline for a few hours Wednesday and missed out on big yet seemingly contradictory news from the Littoral Combat Ship world. The first LCS-related story came out of the Surface Navy Association National Symposium in Crystal City, Virginia, just outside Washington. The great and powerful from the U.S. Navy surface-warfare community assemble periodically to deliberate about weighty matters facing the service. LCS is one such matter. The proceedings were upbeat by most accounts. Reporter Sandra Irwin assures us, for instance, that “After years of battling naysayers, Navy leaders are confident that the much-maligned Littoral Combat Ship has left its troubles behind. They insist the ship is no longer an experiment and will become a linchpin of the Navy’s Pacific pivot,” Irwin goes on to catalog statements from senior leaders to the effect that the LCS has proved itself — silencing its detractors. Take that!!! The second story comes from the redoubtable Chris Cavas over at Defense News. Cavas reports that the Office of the Secretary of Defense “has directed the Navy to limit its overall buy of littoral combat ships to a total of 32 ships, foregoing 20 more of the small, fast and controversial warships.” That’s a cut of nearly 40 percent to the final tally (just over 40 percent of the original goal of 54 hulls). Navy officials, notes Kris Osborn of DOD Buzz, subsequently reaffirmed plans to purchase 52 of the vessels. In short, the program’s future appears to remain up in the air as the Pentagon and the navy wrangle over the military’s budget request for 2015. Hence the clashing stories. In all likelihood they’re the outward manifestations of an internal bloodletting over dollars and fleet composition.Now let me grind an LCS-related axe. The LCS debate is a necessary one and should be waged evenhandedly. That doesn’t always happen, even in purportedly objective reporting on the program. Exhibit A: the use of terms like “naysayer” to describe those who raise legitimate objections to the concept or the hull itself. Naysayer isn’t a neutral word for someone who disagrees with you. It’s a political label you hang on someone to get people to ignore him. I would dismiss Irwin’s use of the word as lazy wordsmithing, a one-off thing and no big deal. Except that if you Google “littoral combat ship naysayer,” you’ll discover how often the term (and similar ones) has been deployed on LCS’s behalf over the years. That looks like a tactic, not a slipshod word choice. The reciprocal tactic would be for folks like yours truly to start branding LCS backers “cheerleaders” for the program. The one group mindlessly opposes, the other mindlessly, well, cheers on its team. Yay! That sounds like an old B-movie: Naysayers vs. Cheerleaders. It doesn’t get us far, does it? Such terms have no place in serious reporting — let alone debate over a program on which the U.S. Navy has staked both its future and America’s standing as the world’s premier sea power. But since we’re having fun with words, why don’t we rehabilitate this one? There’s nothing intrinsically wrong with being a naysayer. It all depends on what you’re saying nay to, doesn’t it? As theologian and author C. S. Lewis observes, if you find yourself on the wrong road, “progress means doing an about-turn and walking back to the right road” — in which case “the man who turns back soonest is the most progressive man.” As with progressive politics, so with weapons programs. Yea may be the enlightened answer to some question. Or it could be a retrograde answer. It all depends on the merits of the case. Labels also mask differences among those being labeled. I don’t consider myself an LCS naysayer, even in Lewis’s sense. More like an eh? sayer. A proposition has been advanced. I await proof. The data to reach judgment are far from complete. It’s tough to gainsay the basic concept behind LCS, namely that future platforms should be able to swap out sensors and weapons swiftly as new technologies mature. But great ideas may work in practice, they may not, or they may underperform. That’s where we find ourselves with LCS. Will the hardware vindicate the claims put forward on its behalf, letting the vessel accomplish missions X, Y, and Z? That question remains open. And it will remain open for some time to come. For example, mine-countermeasures and anti-submarine-warfare “modules” will comprise the LCS’s main armament for hunting mines and subs. The ship will carry one module at a time, equipping it for one mode of combat. Defense manufacturers and LCS crews will test out these systems over the next few years. Neither will be fully operational before 2018, according to official estimates. Navy spokesmen such as Vice Admiral Tom Copeman, commander of navy surface forces, voice optimism about the MCM and ASW modules’ prospects. That’s right and fitting for someone in his lofty position. But even Admiral Copeman concedes that these systems must undergo testing “to prove it to the world.” Right. Thanks, admiral!! That’s how the scientific method (http://books.google.com/books/about/The_Logic_of_Scientific_Discovery.html?id=Yq6xeupNStMC) works. You make a hypothesis, test the hypothesis, and draw conclusions — in that order. No skipping ahead to the conclusions. We are all skeptics now. Or should be. Furthermore, weapons engineers are adding an anti-ship missile to the LCS’s surface-warfare package. But that missile, the Griffin, boasts such short range (only about 3.5 miles, well within visual sight) and limited hitting power that it will only be good for knife fights, not the extended-range engagements of which many prospective adversaries are capable. You don’t want to fight at close range. Accordingly, opponents sporting longer-range weaponry may simply stand off beyond the LCS’s gun and missile range and pound away, hoping to exhaust its supply of defensive missiles or sneak a round past. This handicap will persist until something longer-legged makes its way into the LCS arsenal. When that will happen is anyone’s guess. 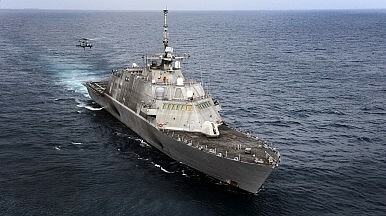 Bottom line, it seems the LCS program remains about where it was before this week’s flurry of news. That’s probably why its legion of skeptics has been quiet of late. It’s certainly the case with this one. Littoral Combat Ships are joining the fleet whether critics like it or not. Here’s how to use them.